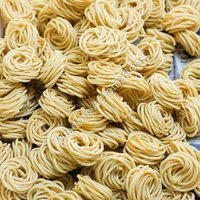 Murukku is an Indian snack, that has a savoury and crunchy texture. Murukku is a Tamil word, which actually means twisted, which is its shape. The main ingredients for making this snack item are rice flour, urad dal flour, sesame or cumin seeds, asafoetida and salt. The dough is made of these ingredients by addng water into it. A mould is needed for creating shapes from this dough. 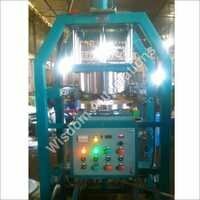 In commercial kitchens, where murukku is made in a large amount, a murukku making machine is used. This machine is operated by either, electricity, hydraulic or pneumatic. The dough is fed into the container, which is pressed straight in oil. 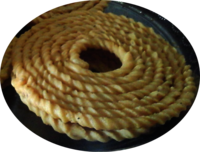 The shaped murukku is deep fried in vegetable oil, till golden. Other kinds of murukkyu that can be made in this murukku making machine are mullu murukku, thenkuzhal murukku, thengai paal murukku, godhumai murukku, kaara murukku, poondu murukku, vennai murukku, besan murukku, arisi murukku and chu murukku or achappam.